It has been thirty years since Pet Shop Boys Neil Tennant and Chris Lowe met as students in an electronics shop in Chelsea. Since then they have gone on to become one of the world’s most successful bands, selling over 100 million records and cultivating a unique catalogue of songs which straddles the fine line between pop and art. In the past year the pair have been hectically busy as usual. In March they launched their hit ballet “The Most Incredible Thing” at Sadlers Wells, before taking to the road to support Take That on the biggest tour in the history of the UK. Somehow they also found time to write 16 new songs for their next album which they are due to start recording this month. A few minutes later Chris arrives looking slightly agitated and muttering about the terrible journey across London. Fortunately, he spots the box of patisseries in my hand; his face immediately lights up. “Oh, you’ve brought cake! Well, that changes everything of course,” he enthuses, “I’ll even have a cup of tea now”. As we sit down with tea and cake, I begin by asking them about their ballet – why did they decide to write it? “As far as some of the critics are concerned there’s always the slight whiff of a vanity project with these things.” sighs Neil. I ask whether writing a ballet will change their approach to pop. “It’s quite different to writing a pop song – the structure is far less rigid,” answers Chris. “You write a ballet to according to a set of themes, with longer melodic sequences. And best of all, I don’t have to write any lyrics”, Neil adds with a laugh. The conversation turns to Take That’s Progress tour, for which the Pet Shop Boys provided a support set which one journalist compared to ‘getting Michelangelo in to paint the kitchen ceiling’. So, how did it feel to be part of the biggest tour in UK music history? “Well one of the reasons we did it was that they were performing eight nights at Wembley Stadium – phenomenal,” says Chris between mouthfuls of cake, “I think only Steps are going to surpass that. Of course we’ll be supporting them as well. We’re the band you come to for supporting multiple stadium nights”, he adds with a distinctly mischievous glint in his eye. Neil looks slightly exasperated. “Don’t be ridiculous, Steps aren’t doing stadiums”. I ask Neil and Chris about the recent Time Magazine feature which names their 1991 single ‘Being Boring’ as one of the best 100 songs released since the magazine began in 1923. Unwittingly, I seem to have stumbled upon what appears to be an exclusive announcement. “I was listening to some of our old songs recently, because we’re putting out another B-sides album in February, like an ‘Alternative’ part two. But we’re calling it Format,” says Neil, referring to their classic B-sides collection from 1995. “Well why not – these things are usually leaked through some Japanese website anyway. I’d rather it came out here,” insists Neil. “It’s all our B-sides from 1996 to 2009, starting with The Truck Driver and His Mate”. 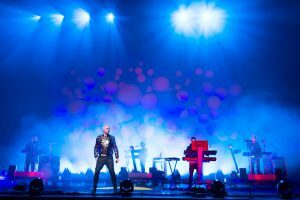 “We should do that” enthuses Neil, “Just ‘Pet Shop Boy’ – we could cover the same number of venues in half the time, doing a DJ set”, he giggles, “Of course, we’ll just play our own records off vinyl”. With the new album set to be released next Autumn, as well as the release of a B-sides collection and the return of their ballet to Sadler’s Wells, they may well need to employ such time-saving techniques. 2012 looks to be yet another busy year for the Pet Shop Boys.